In addition to her responsibilities as the Director of Marketing & Admissions at The Manor at Blue Water Bay in Niceville, Florida, Teresa Halverson serves as the President of the Fisher House of the Emerald Coast, Inc. She has been with the Manor for 12 years and joined the FHEC board in January of 2012. Teresa and her husband Bob relocated to the area after Bob’s retirement from the Air Force in 2000. She has a degree from the University of Las Vegas, NV in Social Work and is a graduate of the Okaloosa Leadership Program. She is a Niceville/Valparaiso Chamber of Commerce board member, serving on various committees, including Military Affairs, and is presently the Vice President of Membership Development. 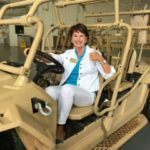 Teresa is also a member of the Emerald Coast Military Affairs Council, the Fort Walton Beach Chamber of Commerce and was recently selected as an honorary with the 53rd Wing at Eglin Air Force Base. Teresa and her husband have one son, Garret, who is serving as an officer in the Marine Corp. When not volunteering or working, Teresa and Bob participate in local art shows as glass and jewelry artists.